"Bigger is better. Really, unless you have a tiny area of roof for collection, get as much storage as you can afford." There are many good reasons to store water. Many lifestyle farms have no access to town supply water and rely on bore or rainwater. Even if you do have access to town supply water, having a water tank for rainwater is a good idea. In some areas, having a water tank may be required when building a new house. Bigger is better. Really, unless you have a tiny area of roof for collection, get as much storage as you can afford. While households can and have survived on small tanks, it's much better to have lots of storage. For one thing, droughts are becoming very common - those fifty-year droughts seem to be more like three- or four- year droughts. Also, generations past do not seem to have the same hygiene standards as we modern types. I'm certain that some teenagers need a water tank all to themselves! If your tank will be feeding troughs then you need to consider how much water they will drink too. Here is a handy guide. Before buying a tank, you need to think about where it is going to go. All tanks need specially prepared bases to sit on. A litre of water weighs about 1kg, so 25,000l of water will weigh about 25 tonnes, and that doesn't include the tank! If you have a hill above your property then you can consider pumping roof water from a small tank up to the main water tank. This will give you gravity fed water to your house which is quieter and means that you still have water even if the pump isn't working. Don't place the tank in such a way that access around your house is made difficult. Depressing as it is, think of what emergency services may want to get at in an emergency. Think too about the overflow from the tank and where that will flow to - don't undermine the tank base or have a stream running to your back door. The material your tank is made from is largely a matter of personal preference. Neither concrete nor plastic is an absolute winner. Plastic tanks are generally a little cheaper than concrete. Corrugated iron tanks are not very common in New Zealand, although new, slimline corrugated iron tanks are made for more urban environments. Concrete tanks are created by either a moulded (or precast) process or a plastered process. Moulded tanks are usually much stronger and more durable. Can be buried underground. Aesthetically, burying removes what can be a blot on the landscape and a buried concrete tank can also be used as a retaining wall, a walkway or a patio. It can also be fitted under a deck. Keeps water cool due to the high insulation value of concrete. Your site needs to be accessible to a hiab or similar otherwise the tank will have to be built on site. It is not easy to retrofit new outlets to the tank. The tank may be damaged by earthquakes. They tend to be more expensive to buy and install than plastic tanks. Plastic tanks are made from UV-stabilised, food grade polyethylene. Plastic tanks are easy to manoeuvre into position. It is relatively straightforward to retrofit outlets. Because they can flex a little, plastic tanks can withstand earthquakes. They're generally cheaper than concrete tanks to buy and install. Plastic storage tanks can't usually be buried more than 500-800mm which means you'll have to live with them or hide them with planting. Water may warm slightly in hot weather. 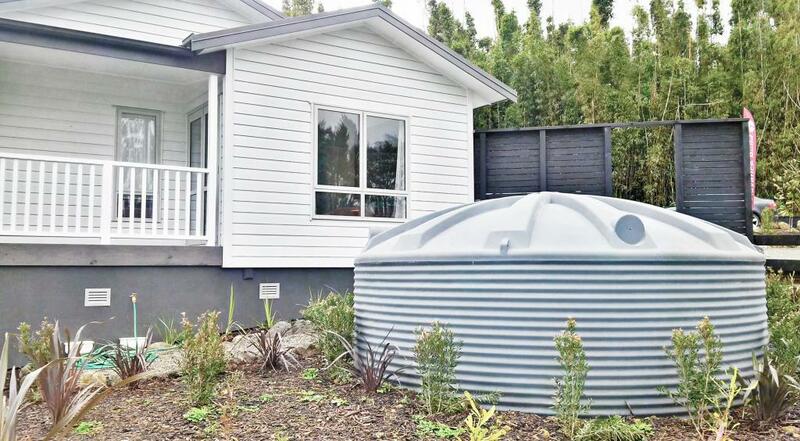 Not surprisingly, as water tanks have been very common in New Zealand for many years, there is a whole industry devoted to repairing, maintaining and cleaning them. Concrete tanks should be given a cement wash every few years to counteract the leaching of lime into the water. If you choose a plastic water tank then test the acidity of your water and plan how you will raise the ph of the water if it is too acidic. When you put in a new tank you should think about how you will keep the water clean. Contaminants on your roof will be flushed into the tank, you should aim to minimise this by diverting the first flush of water away from your tank. There are many products that do this or you can create your own.